Since I started collecting Barbie, I have always wanted to visit a doll factory to see how the dolls are made, but I never got a chance. I just watched this Video on YouTube, now my curiosity is satisfied, I have been to YiWu city for many times, one time I even toured with a URBFC travel doll … the city has the largest wholesale market in the world. but I never knew there is a doll factory in the city. I am sure Barbie’s production procedure is the same. I have no idea who she was, it doesnt matter to me anyway. This is my new purchase, I wasnt going to buy her, but a”$25 off $100″ coupon got me. so she came home. I did not like her Kanekalon hair, hair-transplant was very necessary. Isn’t she the cutest girl in town?! Honestly, “Masquerade Gala” from 2000 was more like ‘Carnival of Venice”, this “Venetian Muse” is just another Halloween Witch. I decided that I should not have more than 120 dolls based on the living space I have. I started “Liquidating” at the beginning of August, the process is very slow, as I often get lazy and don’t want to do a thing. The Plan is that I downsize my loose dolls first, after the numbers of these deboxed dolls go down to 60, I’ll start organizing my NRFB dolls. It’s hard to say exactly how many NRFB dolls I have, they are scattered everywhere except for bathroom. I don’t want to move stuffs to count the total numbers. I think I have less than 250, I’ll leave them as they are for now until the loose dolls are gone. I wish I didn’t buy so many dolls, but they served their purposes– they were my shopping therapy that helped to create a happy mood when I was depressed. Then, too many dolls are piled up, they become the new source of anxiety. 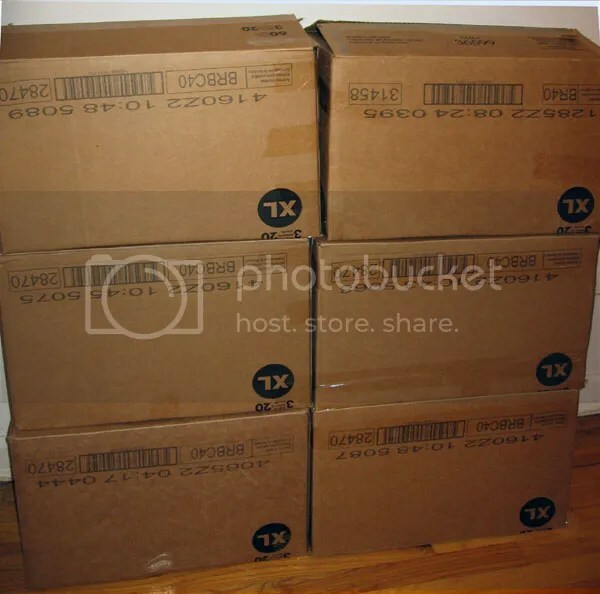 Looking at these boxes of dolls really kills my desire for new dolls. I buy so much less than before, the last time I purchased a doll from eBay was Nov. 7th, 2013, a loose Grace Kelly Silkstone doll. 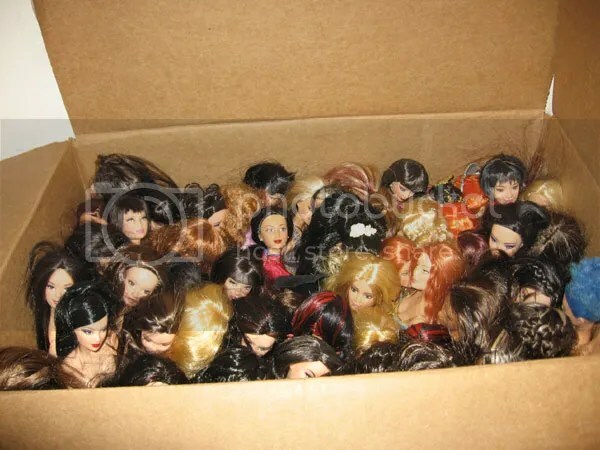 I still buy from Mattel, but only if I am able to sell off some older dolls on eBay. She started as “Dulcissima”, I did not give her a new name. The Champagne bottle & rose bouquet are from my local shops that sell wedding party supplies. Here she is, in the raffle room. her Lot number was 200, very much like a lucky number. A day later, the Doll also collected 2 boxes of tickets. Many of my friends said they wanted to bring her home with them, but again, a Stranger had better luck..
our club made a donation to Barbie Convention raffle room as we did in 2011, 2013. The donation includes an OOAK silkstone doll and many quality doll outfits and accessories. One day I saw this Museum Piece on internet, so I decided to make a similar dress. we have very generous members who donated lots fantastic fashions and accessories, I do NOT have individual photos, I wish everyone had taken photos of her/his donations so I could post here. She was a hit in the 2014 convention raffle room and attracted big crowds. her ticket collecting box was full, so an extra box was added. I wished someone I know would win this big lot. Apparently the strangers always have better luck. 🙂 Wherever she is now, I wish her happily ever after, as she is made with love. A week has quickly gone by, Lea enjoyed being under the spotlights, our week extended to 8 days! Now its time she takes a bow and closes the curtain! If you have not had enough of her, please see my old post “The exotic faces of Lea” from 2011. 1) The list is incomplete & unofficial. 2) Release Year is the Year printed on the Doll Box. Lea is a very new friend of Barbie’s, no more than 100 Lea dolls were released, most of them are Playline dolls that are inexpensive, it doesn’t cost you an arm and a leg even you want to have a complete collection. I don’t have all of them and I have no intention to buy all of them. I started collecting Leas as she is Easy to collect b/c of her very short history. Many people found my blog by Googling up “Fashion Fever”, although the entire week I have been posting Lea, the most popular search term (keyword) is still “Fashion Fever”, and the “Fashion Fever” Page remains to be the Most-viewed page. so I must post a Lea from Fashion Fever, there are many very pretty Lea(Kayla) dolls in this series, such as Osaka, Berlin, Modern Trends Lea, Kira …. you can pick a bunch… but I’ll let this girl take the center stage, as she was the Last Fashion Fever Lea I bought, soon after that, the “Fashion Fever” was replaced with “fashionista” –all the good things have to come to an end. We used to call her Lavender Lea as she was originally dressed in a fluffy Lavender coat. It would be crazy if she wore a heavy coat in such a hot summer day, so she is now in a summer dress. Lea usually has boring black or brown hair, this Lea is different. she has Purple hair. so she is one of my favorite Leas, she is special as she was gifted to me at 2013 Barbie convention by my friend & table hostess Sandra. so I have kept her intact, I did not change her, redress her like I often do to other dolls. She was a customized Kayla form “Charm girl or Secret Spell”, her original hair was red. she and her friends Barbie & Christie caused a storm back in 2003. Parents did not like Barbie & her friends to play wiccan. (but they have no problem with Twilight Vampires who drink your blood, strange, isn’t it? ) Anyway, the Charm Girls were recalled, Mattel made peace with the parents. 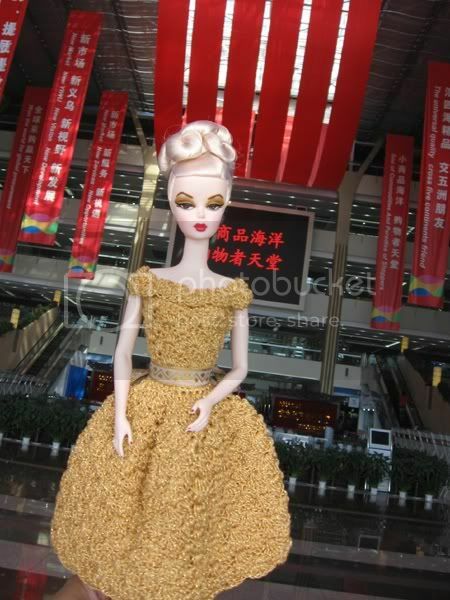 She is the “Dolls of the World– China” , released by Mattel in Nov, 2011. I purchased her a couple of days ago at discounted price. This doll has lots of wax glue inside her head, the glue completely ruined the hair, her hair is sticky, greasy and dirty… you can never clean it up with soap & water. I pulled out some glues and washed her hair with acetone, it still feels greasy. I have no idea why Mattel pours glue into the doll head. many of us hate it. I probably will reroot her hair–that’s the only way to completely get rid of the glue. here is a pettion asking Mattel to stop using wax glue.